The campaign group was formed after a village meeting in November 2016, where 300 people rejected the City Council’s Draft local plan proposal to locate 2,500 houses + commercial /Industrial usage, a cemetery and considered University facilities, on a greenfield site, comprising pristine rural landscape, and adjacent to a National nature reserve and SSSI site. The land is in the parishes of Ailsworth & Castor and at its closest point is 100m from the Ailsworth Conservation area. It is also within 200m of the small village of Upton and a similar distance from Castor Hanglands. The site is on prominent rising land in the Nene Valley and on the limestone Nassaburgh plateau on the western “best landscape” approaches to Peterborough along the A47. 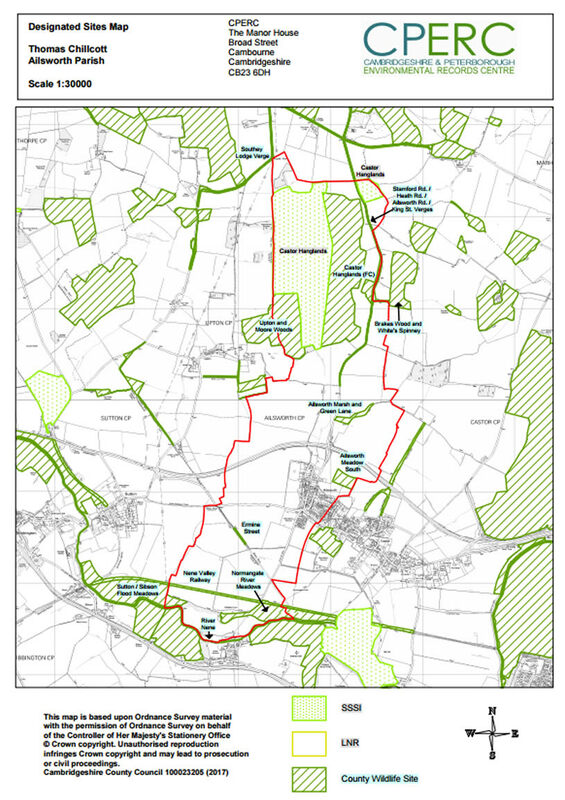 The proposed large settlement would lie within the parishes of Ailsworth and Castor and would overshadow the villages and conservation areas of Castor & Ailsworth and the Nene Park Trust rural estate beyond. The site is 4 times the size of Castor & Ailsworth combined and is a staggering 100 times the size of the small Village of Upton. In addition to the backing of residents, the campaign group also has the support of the Ailsworth Parish Council, Castor Parish Council, Sutton Parish Council, the people of Upton, our local Ward Councillors and Shailesh Vara our MP. PRP also works closely with the Castor & Ailsworth Neighbourhood Plan team and has their full support. During the campaign, we have established relationships with local, regional and national organisations, who share our concerns with the inevitable negative impact that a large single development would have on the landscape, its wildlife and biodiversity and nearby villages. Many of whom will be responding to the consultation directly. The PCC Sites Evidence report, one of the Local Plan’s supporting documents, states “this is the most sensitive area within Peterborough Unitary Authority in terms of both scheduled and unscheduled remains”. The site and surrounding area is rich in archaeological and historical remains, with significant evidence of major Roman, Saxon and prehistoric settlements. The site also features ancient trackways and Medieval lanes for passage and droving, both within and immediately adjacent to the proposed site. The distinctive rural character, has direct links to the fact that the Parishes were some of the last to be enclosed in the late-19th century, under the Enclosure Act. One of the nation’s finest Norman churches has been visible from the surrounding countryside for nearly 1000 years. 1) PRP challenges PCC’s OAN, originally assessed at 25,125, and increased by 2,500 to 27,625, following a memorandum of understanding from Cambridgeshire County Council. Surely this understanding is only appropriate if housing can be delivered on sustainable brownfield sites. To sacrifice a pristine piece of rural countryside rich in wildlife and heritage for the sake of houses needed elsewhere must be questioned by Peterborough City Council. 2) The Growth Strategy Evidence report, despite being referred to as the evidence base on which this and other site allocations were made, does in fact not exist. The reason given is that it had insufficient evidence to warrant publication and will be published later in the consultation process. Potentially in the Autumn of 2017. As the evidence is deemed by PCC Planning as insufficient, it is unclear on what basis the sites were allocated, although on examination of the Sites Evidence report it shows that sites were allocated in many cases, and particularly this one, without due consideration to the facts of the assessment. 3) The Plan itself sets out policies relating to Urban areas, Village envelopes and Rural areas. The proposed large settlement is NOT within an Urban area. It is also NOT within a Village envelope. Therefore, by process of elimination, it must be in a rural area. So therefore, policy LP2 applies, which states that any building in the Rural area, should only be considered for the provision of housing for agricultural workers for required proximity to their employment. 4) The City Council and its Local Plan Vision refers to a ‘Characterful network of villages in an attractive rural landscape’. And yet, the proposal is to locate a large urban settlement, in attractive rural landscape, in the middle of the characterful villages of Sutton, Upton, Ailsworth and Castor. It directly contradicts its own vision and seems at odds with the city’s ambition to be the Environment Capital of the UK. 5) Despite the Site Evidence Report Selection Criteria showing that the Great Kyne site has many ‘red and amber WARNING lights it has still been assessed as a ‘preferred’ site when many other ‘rejected’ sites have indeed scored considerably better. Great Kyne has an understandable 9 Reds and 10 Ambers which is significantly more than most 'rejected' sites in our sample. (see Appendix Three). How can you say in your comments on that report and site that there are only "minor constraints"? That should be applied to very many of the rejected sites, some of which are in our table as more relevant examples. Rather than take into account the plans Visions and objectives has this proposed allocation been graded as preferred due to the landowner being HCA? Has PCC succumbed to Government pressure despite the fact that this greenfield site does not comply with many of your local planning policies as evidenced in our letter and many residents' letters and from local, regional and national organisations. 6) The Objectively assessed housing need has been based on pre-Brexit population growth trends and outdated employment figures. Indeed, the latest Employment rates (January 2017) show a downward trend since the LDP was issued. Other Councils have taken the view, that with this level of uncertainty, it would be prudent to put on hold their local planning, with a view to adjusting those plans, when a clearer picture of inward migration is available. 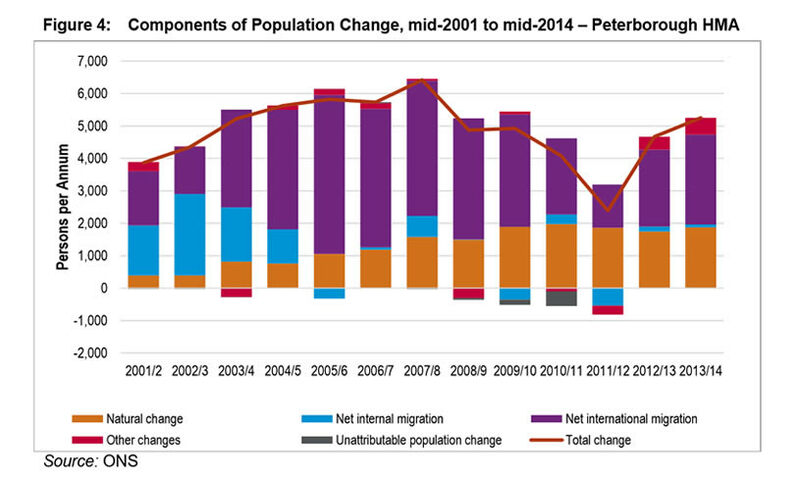 Surely this should apply to Peterborough, with its previously high levels of external migration over the past decade or so. b. The site and surrounding area is home to 121 animal species, which are listed under Section 412 of the NERC Act (2006) and are UK BAP Priority Species. 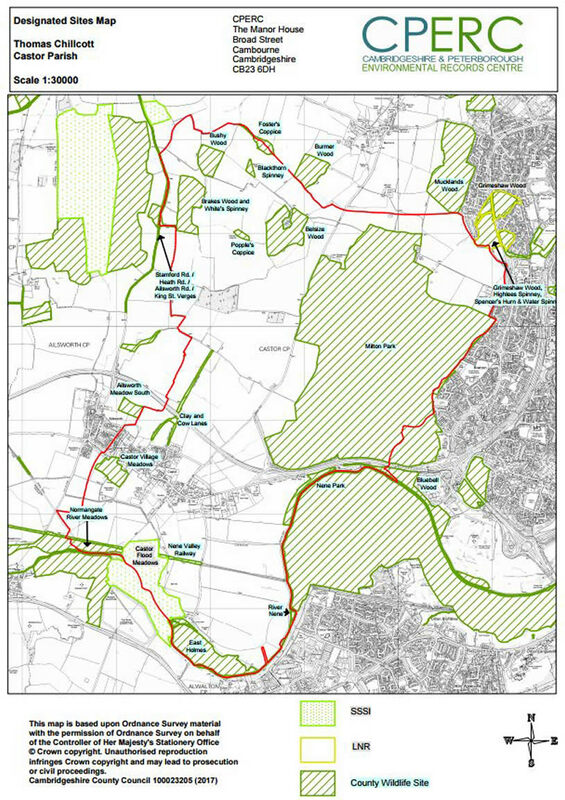 c. It will therefore remove rather than “enhance important views” of the Nene Valley, including the Hanglands and St Kyneburgha Church specifically, both from within the area, the villages, Nene park Trust rural estate and the western approaches to Peterborough along the A47. The villages of Castor and Ailsworth are not averse to growth and development as evidenced by absorbing 75 homes over the last 10 years and with Neighbourhood Plans proposing a further 50 homes. This represents a total of 125 homes a 25% growth over 30 years. The Great Kyne site makes up an area used by residents of Peterborough for walking, cycling and other outdoor pursuits and its ecology, biodiversity and historic remains should not be overlooked. Peterborough’s immediate countryside should be enjoyed by the people of Peterborough and protected for future generations and not traded for gain to ease housing issues elsewhere in the country. A draft local plan was published a week before Christmas with an initial closing date of the 26th of January 2017. Under challenge from the PRP team it was acknowledged by PCC planning that holding a public consultation over the festive season thereby resulting in only three weeks in review and comments was unsatisfactory for proper consultation. We welcomed the fact that PCC planning then extended the consultation period to the 9th February. However, we subsequently identified the absence of the Growth Strategy Evidence Report and challenged both its omission, and requesting a delay to the consultation, until it has been provided, to enable proper review and comment. This request was rejected by PCC planning and it was indicated that the growth Strategy Evidence Report would be issued three days later on Friday the 13th of January. When that date arrived PCC planning advised that the report would now not be made public as it contained insufficient evidence. In our view and to quote the views of our own MP, ‘this has made a mockery of the consultation process. More seriously he has criticised the PCC for moving the ‘’goalposts’’, and re-naming it as a less significant Growth Study. This will summarise the evidence towards the end of the plan process in Autumn 2017, rather than at the commencement of the consultation process when it would have been most useful to enable proper review and comment on the plan. We would concur with our MP’s assessment as we estimate the PRP team have collectively spent over 1000 hours reviewing the many documents as part of our response and likewise many residents have also wasted many hours trawling through the documents looking for the same evidence. The PRP remains perplexed by the numerous inaccuracies, missing supporting evidence and contradictions that are contained, or indeed, not contained in PCC’s LDP. The absence of the critical Growth Strategy, which is referenced several times throughout the LDP, indicates that PCC embarked on the LDP in a state of disorganisation and questions the overall validity of the LDP as it stands. We also note that the Further Draft Local Plan of December 16 shows in 7.3, that the site allocation named Great Kyne East had a Status which was live at 1 April 2016. How was it that this was not notified to the Parish Councils and communities until six months later? The cynical amongst us might think that this was a deliberate withholding of information to reduce the time available for the parties mentioned to respond! It could be argued that such a delay was in breach of the Plan Process. 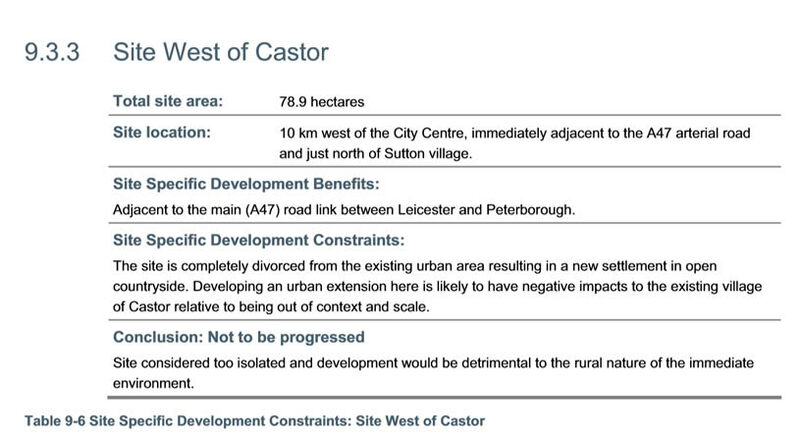 We also understand that The Drift, Castor, which bisects the proposed Great Kyne is Common Land protected by the Commons Act 2006, which is a significant constraint on the delivery of the site. Such challenges, in our view make this whole site unviable, unsuitable and undesirable on every level. PRP’s Review of planning policy is attached to, and forms part of, our objection to the LDP. Peterborough's countryside gone forever, wildlife decimated and the enjoyment of people of Peterborough, not just the Villages, abandoned. Is this the right way to create the Environment Capital of the UK. Policy LP1: Sustainable Development and the Creation of the UK's Environment Capital. The Great Kyne site will not “improve the environmental conditions of the area”. It will be within a stone’s throw of the Castor Hanglands, a designated site of special scientific interest and built directly on habitat that according to CPERC contains or supports locally over 121 species, including a number of ‘Red List’ bird species. Creating a settlement of such size (2500 dwellings) would introduce around 500 or so domestic cats (Mammal Society ratio of pets / dwellings) with all of the carnivorous activity associated with those animals let loose on the unsuspecting fauna in the locale. This takes no account of some 6000 people and their other pets, particularly dogs. Policy LP2: The Settlement Hierarchy and the Countryside. The Great Kyne site is 2500 dwellings with 12 ha of employment land (LP35 and LP40). This is not a small, medium or large village. Neither is it an Urban Extension. The site is ‘countryside’ and therefore there must be compelling evidence to justify this location, Which PCC have not provided. This evidence is conspicuous by its absence from the proposed draft plan. It should come from the Objectively Assessed Needs. This was meant to be updated in Dec 2016 but has not been made public. The most recent OAN, and the one presumably used to support the Draft Local Plan, is based on an update in 2015 prior to the UK’s historic decision to vote to leave the EU. The OAN is clearly predicated on high levels of net international migration by a ratio of over six to one (3010 to 530). See figure below from SHMAU (Oct 15). Given the Governments stated primary objective from the upcoming negotiation with the EU on our terms of exit to take control of our borders and limit immigration it would seem prudent to assume that future international migration will not be anything like historical international migration. This must call into question the underlying rationale for the level and distribution of growth described in section 5.19 et al of the Draft Local Plan. “…Provision will be made for the development of approximately 27,625 additional dwellings over the period from April 2011 to March 2036. Following on from the points made under LP2 the overall total requirement of 27,625 must be called into question and the allocation of 16,851 dwellings to the Urban Extension category similarly questioned. This would appear to be incoherent within the same statement. ‘Campus based’ cannot mean both a location in the City and a location outside of the existing Urban boundaries. Students typically value locations close to the educational buildings themselves and with easy access to night time and weekend entertainment options and National transport links. These would not be possible with accommodation located at the Great Kyne site unless there are additional development objectives not specified in the Draft Local Plan for this site. The Growth Strategy Evidence Report (Dec 2016) has not been published along with the underlying data used to support any conclusion. Therefore the decision cannot have been based on the findings. The proposed Great Kyne site will not enhance the health and wellbeing of the Peterborough population that currently use the area for walking, cycling and riding. Quoting directly from the Draft Local Plan “Areas outside the urban boundary and the village envelopes are considered as countryside for the purpose of policies in the Local Plan.” The Great Kyne site, which is countryside, fits this description. The development is at odds with the Councils own Objective for Land Use and Wildlife and identified issues such as “Peterborough has a high quality natural environment that needs protecting and enhancing”. the exit road from the A41129 to Oundle Road during rush hour should be all that is necessary to confirm that adding something like 1000 extra vehicles onto the network at rush hour will require significant investment to alleviate the delays experienced by commuters at these and other locations in the area. By definition adding a large-scale development well outside the existing urban network of transportation infrastructure must increase private car use and not reduce it as desired by the Council. The Great Kyne site will have significant impact on an ancient and fragile landscape. There are multiple archaeological sites on the proposed development area with evidence from, Bronze and Iron age peoples, Roman occupation, Saxon farmsteads through to medieval farming. A detailed report completed by Dr Stephen Upex, highlights 28 sites on the proposed development land, many of which would be regarded as archaeologically significant, with large scale, open area excavation being required should there be any change to the land use. The area contains a broad variety of sites, from Bronze Age ‘ring ditches’, Iron Age settlements, Roman roads, Saxon and medieval farming examples. There are also many ancient tracks and wide medieval lanes that were protected following land enclosure and consequently provide rich green protected areas. There are several very significant archaeological features spread across both parishes Castor & Ailsworth, many of which fall within the proposed development area. Not only are many of these sites important in their own right, but they should also be considered as part of the total landscape of the nationally important Durobrivae area. It is scarcely credible to suggest that a 2500 dwelling development with light industrial and logistics areas within will, in anyway what so ever, “enhance the character and qualities of the local landscape”. 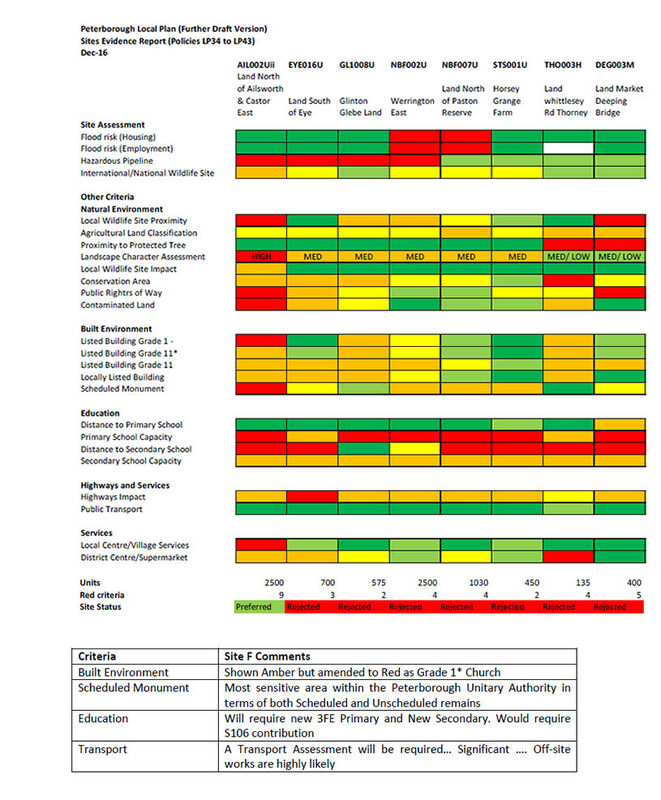 Further, your own Selection Criteria in the Sites Evidence report state the Landscape Character Assessment as “High”. It will do nothing to “enhance important views” of the Nene Valley. The proposed site comes within a few hundred yards of the Castor Hanglands Site of Special Scientific Interest (SSSI). This will have an adverse effect on a designated site, including harm to habitats or species of principle importance. The Castor Hanglands is a site of Ancient Woodland, of which 75% has been re-planted, and supports at least 40 woodland species, 10 of which are indicators of Ancient Woodland (e.g. Wood Melick (Melica uniflora), Yellow Archangel (Lamiastrum galeobdolon) and Ramsons (Allium ursinum)). It has a mix of Grade 1 broad-leaved and coniferous woodland, and species-rich Grade 2 calcareous, neutral and acidic grasslands. The main pond is also a known breeding site for the Great Crested Newt (Triturus cristatus). Regrettably the Green Infrastructure and Biodiversity SPD is not available for review during this consultation period. It is not possible to understand how this document may have influenced (or not) the site assessment process resulting in the Great Kyne proposal. Our own research in this area suggests that the site is a significant resource rich in bio-diverse habitats supporting many species of wildlife including a substantial number identified as at risk by bodies such as the RSPB. 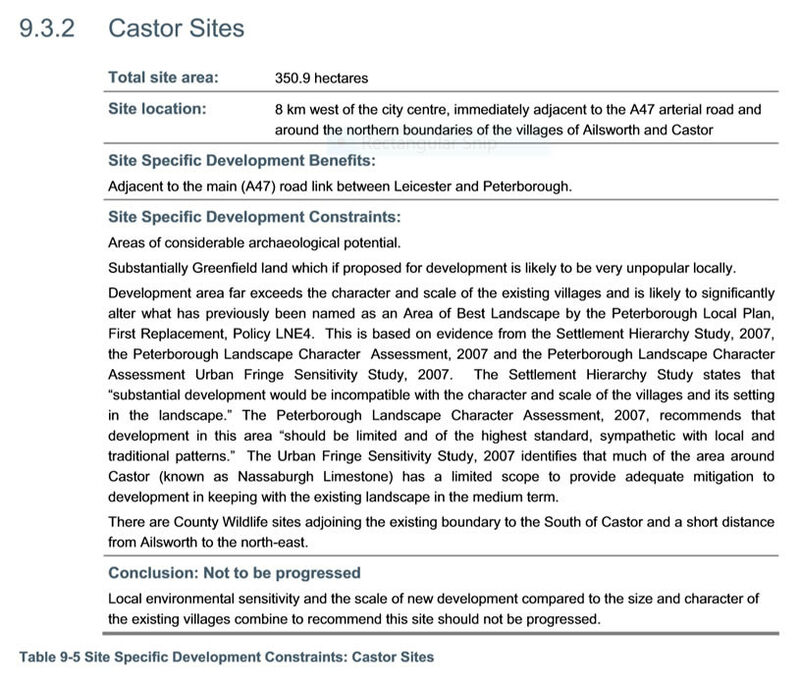 CPERC maps showing designated sites in Castor and Ailsworth and their proximity to the proposed development are shown in Appendix Two. development must be accompanied by a flood risk assessment to ensure that flood risk is not increased elsewhere “. Also Environment Agency comments on the ‘Preliminary Draft Local Plan Consultation January 2016’ in on this subject have not been incorporated. The Environment Agency’s website identifies a number of areas on the proposed site, at Castor Hanglands and within the villages of Castor and Ailsworth which are currently at High risk of surface water flooding and many more areas which are medium/low risk. Part of the development will be on Ailsworth Marsh, an area of nature conservation value and a high proportion of which lies wet for up to half the year (documented in the countryside Management project Site Data Report). Therefore whilst the site is in flood Zone1 the scale of the development will significantly increase risk of flooding to local residents and those downstream, particularly from surface water flooding and sewer flooding. It will also increase risk of flooding from fluvial sources further downstream. The Strategic Flood Risk Assessment Update (p34) also refers to sewers being at capacity with Castor and Ailsworth and significant upgrades to infrastructure will be required. The Strategic flood Risk Assessment (2010) Appendix F states that the sites at Castor passed the sequential test but were ruled out due to other constraints. No detail has been given as to why these constraints no longer apply. The site has not been assessed as one of the strategic sites within the Waste Cycle Study (2010). The policy should recognise the impact on water quality from surface water runoff as well as waste water treatment from commercial, industrial and urban development. The size and nature of the development at Castor & Ailsworth has the potential to significantly impact on the local aquatic environment and that further downstream. There have been several pollution incidents arising from Flag Fen’s waste water Recycling Centre. Anglian Water should be consulted on this plan and asked to demonstrate they have capacity to treat waste water from any new development without causing a deterioration of the current water quality and that any increase in flow to the sewerage network does not increase flood risk. The policy should incorporate impacts of climate change and the affect this will have on flood risk from new developments. The policy should be updated to ensure that it has fully considered new guidance published last year on “flood risk assessments: climate change allowances” and should take account of the guidance published on.gov.uk. As stated earlier in this response there is no credible data available to support the overall level of housing required for the Peterborough area and therefore the allocation of 10% of the original total of 25,000 to this site must be questionable. We note the intent to include a special assessment of the transportation needs such a large-scale development would create. We have noted elsewhere the somewhat surprising recommendation to include student accommodation in the development that is contradicted by the stated objective of a campus based University in the City. We have drawn attention elsewhere in our response to the considerable number of omissions to the list of specific requirements that would appear to be appropriate – such as flood risk, wildlife habitat and preservation of landscape with special characteristics.